(Nanowerk News) A new generation of ultrasmall transistors and more powerful computer chips using tiny structures called semiconducting nanowires are closer to reality after a key discovery by researchers at IBM, Purdue University and the University of California at Los Angeles. The researchers have learned how to create nanowires with layers of different materials that are sharply defined at the atomic level, which is a critical requirement for making efficient transistors out of the structures. "Having sharply defined layers of materials enables you to improve and control the flow of electrons and to switch this flow on and off," said Eric Stach, an associate professor of materials engineering at Purdue. Electronic devices are often made of "heterostructures," meaning they contain sharply defined layers of different semiconducting materials, such as silicon and germanium. Until now, however, researchers have been unable to produce nanowires with sharply defined silicon and germanium layers. Instead, this transition from one layer to the next has been too gradual for the devices to perform optimally as transistors. The findings are detailed in a research paper appearing Friday (Nov. 27) in the journal Science "Formation of Compositionally Abrupt Axial Heterojunctions in Si/Ge Nanowires "). The paper was written by Purdue postdoctoral researcher Cheng-Yen Wen, Stach, IBM materials scientists Frances Ross, Jerry Tersoff and Mark Reuter at the Thomas J. Watson Research Center in Yorktown Heights, N.Y, and Suneel Kodambaka, an assistant professor at UCLA's Department of Materials Science and Engineering. Whereas conventional transistors are made on flat, horizontal pieces of silicon, the silicon nanowires are "grown" vertically. Because of this vertical structure, they have a smaller footprint, which could make it possible to fit more transistors on an integrated circuit, or chip, Stach said. "But first we need to learn how to manufacture nanowires to exacting standards before industry can start using them to produce transistors," he said. Nanowires might enable engineers to solve a problem threatening to derail the electronics industry. New technologies will be needed for industry to maintain Moore's law, an unofficial rule stating that the number of transistors on a computer chip doubles about every 18 months, resulting in rapid progress in computers and telecommunications. Doubling the number of devices that can fit on a computer chip translates into a similar increase in performance. However, it is becoming increasingly difficult to continue shrinking electronic devices made of conventional silicon-based semiconductors. "In something like five to, at most, 10 years, silicon transistor dimensions will have been scaled to their limit," Stach said. Transistors made of nanowires represent one potential way to continue the tradition of Moore's law. The researchers used an instrument called a transmission electron microscope to observe the nanowire formation. Tiny particles of a gold-aluminum alloy were first heated and melted inside a vacuum chamber, and then silicon gas was introduced into the chamber. 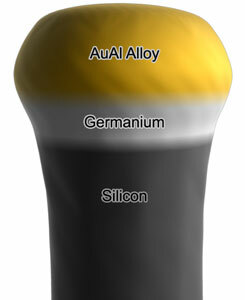 As the melted gold-aluminum bead absorbed the silicon, it became "supersaturated" with silicon, causing the silicon to precipitate and form wires. Each growing wire was topped with a liquid bead of gold-aluminum so that the structure resembled a mushroom. Having a heterostructure makes it possible to create a germanium "gate" in each transistor, which enables devices to switch on and off. The work is based at IBM's Thomas J. Watson Research Center and Purdue's Birck Nanotechnology Center in the university's Discovery Park and is funded by the National Science Foundation through the NSF's Electronic and Photonic Materials Program in the Division of Materials Research.